So I guess you could say I’m addicted to ripples right now. I understand why it was my grandma’s favorite type of blanket to make. There is something mesmerizing about making a ripple; the soft rise and fall of the pattern is like watching the waves of the ocean on a calm day, slowly increasing and decreasing, washing across the sand in a different pattern each time. Crocheting is like watching the ocean. I’m also crocheting some squares to donate to a yarn shop in Virginia that is putting together blankets for the families affected by the Virginia Tech tragedy. Since ASU’s colors are maroon and gold, I already had some maroon yarn lying around. I need to make squares in black, white, and maroon (the other school color for VT is orange, but I don’t stock orange. I’m not sure why cause I love orange). I have been making simple 8×8 granny squares. 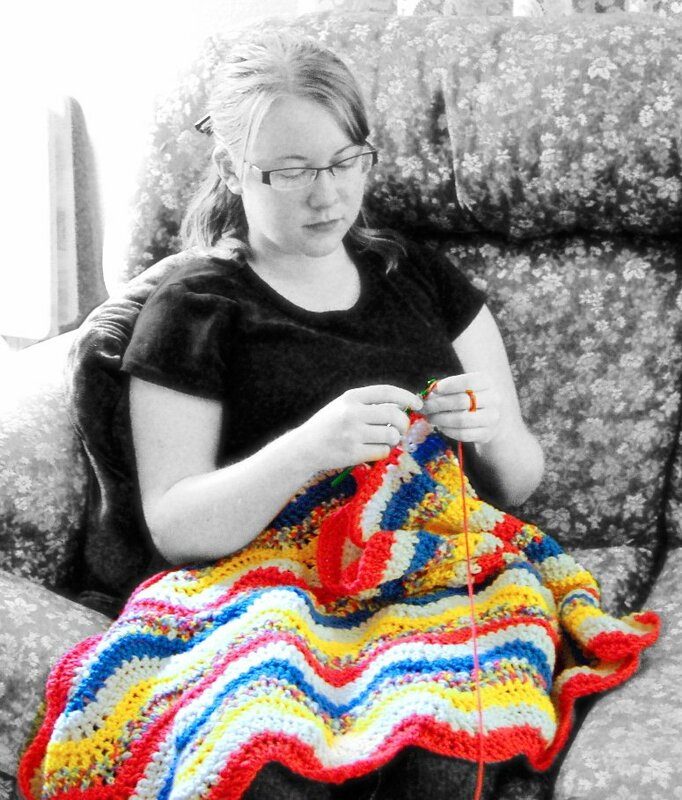 The granny square is timeless, classic, and heart-warming. It comes from a timeless tradition of grannies making squares, which gives it grandmotherly warmth. Since the squares will be interspersed amongst fancier squares knitted/crocheted by other people, my squares will be the subdued, yet comforting squares on the blankets. I have 9 squares and I plan on making at least 12-15 to send off by the end of May. Oh yeah, I have my last final tomorrow. Of course I have been doing all of this crocheting to take my mind off of it: procrastiknitting. It’s an essay final, so there really is no way to prepare for it. I hate essay finals; they are so unpredictable and I hate that. Oh well, almost done. Previous Continental or American? Pick or Throw?